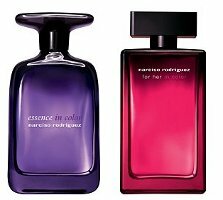 Essence In Color (purple, above left) ~ "Each element of this ultra-sophisticated limited edition has been enhanced to sublimate the original Eau de Parfum in a couture way: Vibrating and colorful top notes have been added to the fragrance, the bottle is dressed up with one absolute color purple - and the outer packaging has a wink at Narciso Rodriguez fashion collages." For Her In Color (fuchsia, above right) ~ "Each element of this ultra-sophisticated limited edition has been enhanced to sublimate the original Eau de Parfum in a couture way: Vibrating and colorful top notes have been added to the fragrance, the bottle is dressed up with one absolute color fuchsia - and the outer packaging has a wink at Narciso Rodriguez fashion collages." I don’t like the bottles anymore; the colouring makes them look cheap. In fact, they’re reminiscent of those Hugo Boss ones. I’m not loving them either. vibrating and colorful = most likely fruits and spices? Beats me. I don’t understand the NR line at all…he seems to just do subtle variations on the same 2 scents over & over. “to sublimate in a couture way”? Exactly. You can never tell. I miss announcing a number of his flankers because I can’t even tell if they’re new or not. But…nothing about the added notes? I like his fragrances, and the whole concept of his fragrance line, but I don’t understand this. Don’t like the colors at all. And I do like some of Hugo Boss offerings. NR specializes in providing as little info as possible, sorry. I don’t know the notes. If it’s any help, I sniffed these yesterday and the fuchsia smelled super-similar to all the other inscrutably-named NRs. My companion noted that the purple, however, was much greener–maybe even more badly in need of a name of its own! I’m in the midst of trying to decide whether to purchase the EDT or the EDP myself; I can never remember which it is I prefer!